I attend Church meetings professionally. It’s an occupational hazard. 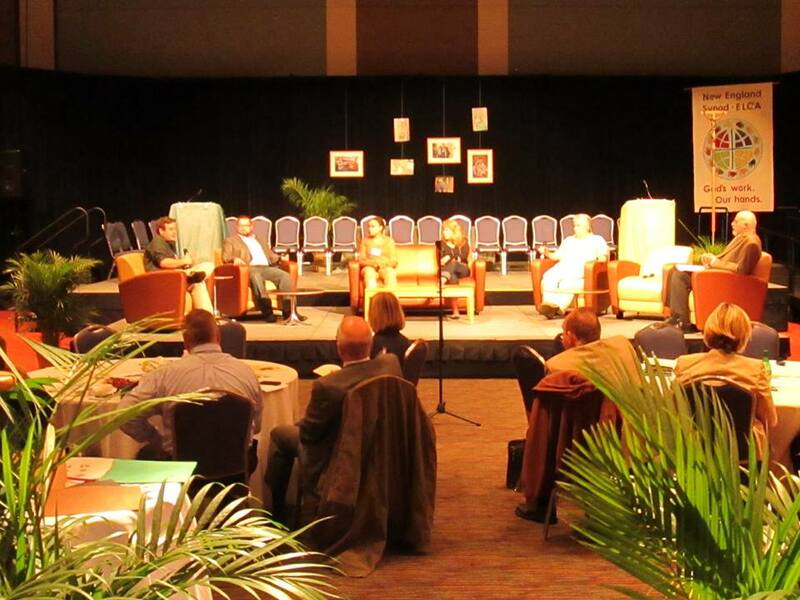 Church annual meetings are mostly insider baseball: committee reports, resolutions, budgets. Church annual meetings are a space where you can just print the lyrics and rest assured all the good Church people who’ve given up a Saturday to attend said meeting will know the tune. The most recent Annual Synod Assembly of the New England Synod of the Evangelical Lutheran Church in America did two remarkable things: It invited ‘outsiders’ to speak to the gathered body and it actually listened to religious nones. After the resolutions were debated and the work of the day done, newish Bishop Jim Hazelwood moderated an 1.5 hr panel with 6 “religious nones,” sitting in daytime television style, living room chairs before a room of approx. 500 Lutherans on a Friday night. Each of the 6 panelists was invited to participate by a pastor. I think it speaks volumes about the deep and non-judgmental relationships between pastors and their non-religious friends that folks would attend and participate. A fear of being ‘an impostor.” The panelists spoke of not wanting to do things that they didn’t actually believe in. Experiences of feeling overwhelmed by traditional worship services. I heard multiple panelists speak of feeling lost, unsure when to sit and stand, and intimidated. Panelists also spoke of thinking it odd to dress up for Church. As one put it “why should I get up early on a Sunday, get all dressed up, to watch people in weird robes?” This panelist found an easier point of entry with a smaller, Saturday evening service. A number of the panelists, though not all, had some religious background. For these people, late teens and early twenties was a turning point in questioning and ultimately, leaving religion. A deep, dare I say faithful, commitment to big ideas and values. The panelists had thought a lot about how they wanted to move through the world, how they wanted to live ethically, how they wanted to change their community. They just didn’t feel the need to do it within the bounds of a religious community. It makes me deeply sad to hear again and again the panelists articulate a perception that religious communities are intolerant of doubt. This panel is also something you can do at your denominational annual meeting. In my experience of attending annual meetings, we talk a lot about new mission starts and outreach/evangelism. We talk a lot amongst ourselves. What if 25% of our time gathered thinking about the future of the Church was with people from outside the Church? I think there are increasing numbers who won’t like us more if we are even clearer about the fact that we “allow for doubt,” or dress differently, or do more volunteer “mission” work (there are other ways people can do stuff in their community) And they may or may not consider themselves “spiritual but not religious.” (The last best hope of mainline Protestants..) Maybe we need to face the fact that increasing numbers of people are just not that into the God thing. Full stop. I think the more and more we listen, the more we will change for the better. From everything I’ve read and heard, religious Nones are not asking for Christianity to be watered down, but to be more robust. I hope you read the article in the Atlantic about this same topic. We also did an interview with Dr. Elizabeth Drescher who is writing a book on the spiritual life of the Nones that confirms much of what you heard. We are not asking religion to do anything except leave us alone. I don’t want to talk about religion. I don’t want anyone to knock on my door. I don’t want anyone to tell me I am lacking anything. I don’t want to hear that you “can’t be moral” without faith. I don’t want to hear how my lack of religion is really just faith in something different and not really that different. I don’t want your religion shaping Laws, Schools, Medical care or any part of public policy. Your religion is your business, keep it to your self. AMEN to that Joshua! AND I don’t want to hear all that original SIN blather either. The monotheistic religions will NEVER be compatible with free thought and inquiry because their basic dogmas all include this erroneous assumption that human’s are “fallen sinners”. Thanks to the DE-MD Synod for posting this on Facebook. It’s going to my Church Council. When I think about the nons in my friends and family I think you hit it right on the head. For me, this had the biggest impact of the weekend. The honesty with which these panelist spoke was both refreshing and rejuvenating. I can sympathize with many of the opinions of the “nones” except that I am lucky that my church, St. Tim’s, embraces discussion and doubt through Bible study, book clubs, and adult forum discussions. I feel like I am just inside the line. I don’t doubt that the speaker was perfectly fine w/o what *she* thought religion was (and/or religion as she has experienced it to that point). I think frequently, when people say they “don’t need religion”, they’re actually already DOING religion, but just don’t realize it. By saying they don’t need religion, they’re just cutting themselves off from all the other people Doing Religion, in ways they don’t recognize. We may not “need religion”, but I think we DO need other people—other people Doing Religion. Sorry, your assumptions are so far off base I can not even begin to address your argument. You might want to start clarifying and separating YOUR opinions about us from the reality we “nones’ experience. Try LISTENING a little closer without your preconceived ideas filtering out what we are saying! This conversation is so important. We can all learn from each other. One of the things I so enjoy about the ELCA (Lutheran Church) is that it is not only ok to disagree and to doubt, but that you are welcome, and you can even discuss these things! *Panelists also spoke of thinking it odd to dress up for Church. As one put it “why should I get up early on a Sunday, get all dressed up, to watch people in weird robes?” This panelist found an easier point of entry with a smaller, Saturday evening service. *A number of the panelists, though not all, had some religious background. For these people, late teens and early twenties was a turning point in questioning and ultimately, leaving religion. *A deep, dare I say faithful, commitment to big ideas and values. The panelists had thought a lot about how they wanted to move through the world, how they wanted to live ethically, how they wanted to change their community. They just didn’t feel the need to do it within the bounds of a religious community. The challenge to clergy to “go out” is an important one. I wonder every time I read that a pastor has 20+ office hours posted. Most of my contact with parishioners happens outside the office and usually outside the church building. This allows for many opportunities to interact with non-parishioners. Do seminarians need to be taught how to go out? It’s pretty hard to go out when the entire congregation expects you to be available at their beck and call. Seminarians don’t need to be taught anything. Congregations need to be taught that the church and pastor aren’t theirs. I’m the editor of the Episcopal Diocese of Central New York’s bi-monthly newsletter “The Messenger”, and I’d like to re-publish this in our next edition. I will of course give you the credit and include a pointer to your blog. Can I get your permission to do this? It’s an important issue, and you’ve written about it quite well! Certainly! Please make sure to give the credit to Bishop Hazelwood & the NE Synod of the ELCA- they were the innovators! I’m just the reporter. Isn’t there a lack of any mention of Jesus in this whole discussion? Where is He in this? The expression, “What would Jesus do,” might just maybe fit in here somewhere. If Christianity were a product or a political party, I would advise assembling focus groups comprising a diverse group of well-educated, affluent consumers in the 25 – 50 year old age-range, and from all the major U.S. population centers, and then I’d just sit back and listen to what they like and don’t like about the brand. I’m not sure how “well-educated, and affluent” fits in with diverse. Excellent. The next step is if a church or denomination decides to embark on something like this, is to commit to not only listening but walking away and spending time reflecting on what was heard and doing some introspection into the truthfulness or accuracy of the concerns. Too often, I’ve seen church people balk at suggestions of change to appeal to those outside of the church. In their mind, changing the way things are done in the church are tantamount to changing or watering down the gospel, but the two do not necessarily have to have anything to do with the other. That’s the mental leap that many people need to make.